Leaks are the most common roofing problems because of the changing weather, environmental toxins, and everyday wear and tear. Identifying a leak early is the best way to prevent serious damage but many people do not realize they have a leak until it is too late. Any visible water damage inside the building indicates that you have a leak. It can be challenging to find the source of a leak, so you should call a roofing contractor to help. If you think you have a leak, you can attempt to find it yourself and repair it if small enough. The first place to check is roof penetrations, such as vents, ducts, dormers, and siding. These are the most common places for leaks to start. Watch for water stains, mold, and black marks and should you notice these, you will know you have a leak. In that case, you should contact a roofer to inspect and repair the problem. It is not always easy to find leaks and some are too small for untrained eyes to find. Hiring a professional roofer will be the best way to find these. By soaking the roof with water and watching for leaks on the inside leaks can be identified. Sometimes drips will appear far away from the actual leak and this is common in roofing where plastic vapor barriers are installed in the insulation. Professional roofers can move this aside to find the smallest leaks that may have been hiding from you. Check the vents: Plumbing vent boots are typically made from plastic, metal, or both. Plastic cracks easily and metal seams can open, making the vent boot a good place to start looking for leaks. Any broken seams or cracked plastic needs to be replaced immediately. When you are replacing the broken or cracked vent, replace all nails with screws because they interfere less with the roofing material. Dormers: When the weather is severe, water can leak from places other than the rooftop. Cracks in windows, dormers, and siding are all possible and will allow water to seep inside. Check the edges with a knife to identify any leaks and then if you are unable to repair the cracks yourself, you can call a roofer to add new caulk to seal the damaged areas. Flashing: Flashing is usually installed in buildings where the walls intersect the roof. Flashing is used to move water away from the roof. 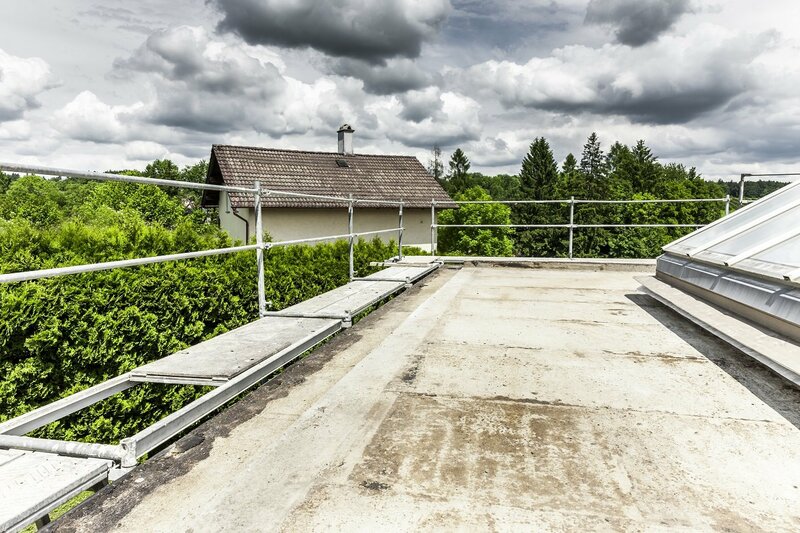 With time they can rust, weaken and allow leaking so if you see any rusted or defective flashing, reach out to a roofer to see that it gets repaired immediately. Call us today to schedule an inspection so we can help you to find any leaks. We have the experience and trained roofers to find even the smallest leak, so your roof will be secure for years to come. 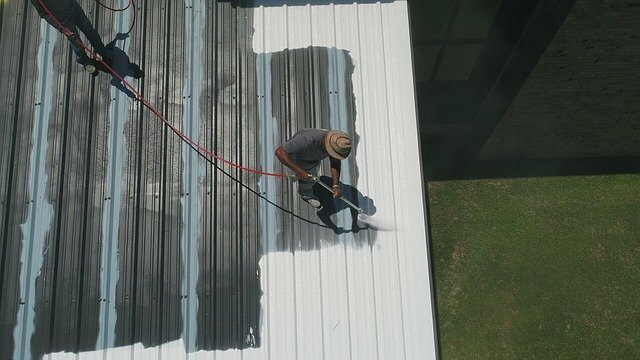 To keep your flat roof looking its best and able to withstand all conditions, you need to work with a professional roofer. They can inspect your roof regularly to ensure that your roof stays safe and strong enough to get through all weather and any harsh environmental conditions. Every roof suffers from natural wear and tear, but with regular maintenance and repairs, it will be guaranteed to last longer. 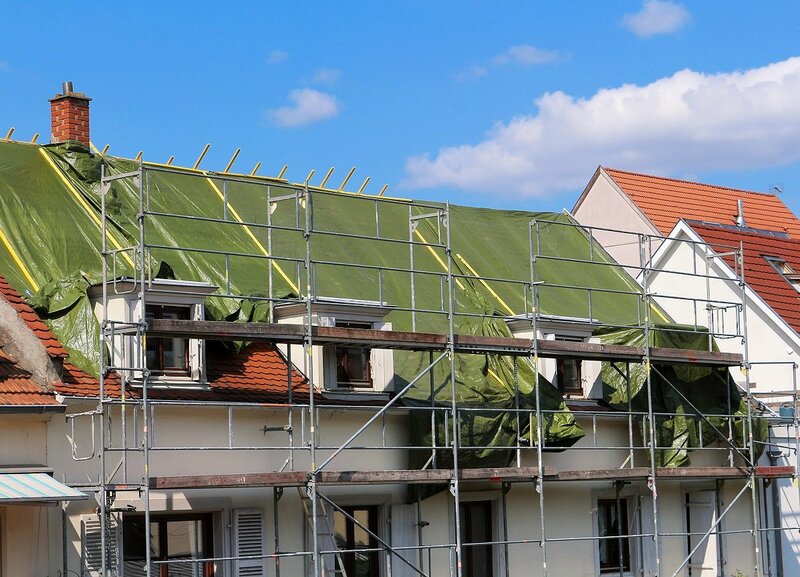 There are some common problems you can expect with flat roofing and hiring a roofer will be the best way to prevent these or get them repaired as soon as they appear. Ponding: This is common with flat roofing and it occurs when water from rainfall or snow pools on the roof. If ponding is not corrected right away, the materials will become weaker and give way to leaks and structural problems. Internal damage can result once ponding has formed and any internal structural damage can be expensive. You should contact a roofer as soon as you notice the ponding to get the situation corrected. Cracks: If you notice cracking or splitting along the membrane, you need to get a roofer out to look at it right away. An experienced roofer can identify any cracks or splits and repair them before they spread and cause further damage. Blisters: These occur when air gets trapped between the felt layer and substrate. This is common with flat roofing and you will typically notice elevated pockets in your roof surface. Call a roofer as soon as you see these air pockets, so they can remedy the situation and prevent more expensive damage. Ridges: When a bituminous buildup occurs within the joints of the roof insulation, the result is ridging. When moisture condenses under the felt layers you will notice ridging along the membranes. These long, narrow crevices are common in flat roofing where membranes are not securely attached. Being aware of these common flat roofing problems will help you identify them in time so that a roofer can be called out to inspect the roof. With regular inspections and maintenance, they can be prevented or repaired if needed. Call us to schedule an inspection even if you have not noticed any of these problems. This is the most efficient way to prevent these problems from occurring or identifying them before they cause too much damage. Hire a professional roofing contractor to take care of your roof so your investment is protected and your flat roof will stand the test of time. Re-roofing: Many decide to re-roof over existing roofing rather than replacing it completely as this is often cheaper. However, this can actually cause you more problems as heat can build up between the old and new materials, creating moisture build up and serious damage. Measurements: Overspending on materials is a big problem with roofing. You need to make sure you only buy what you need so you need measurements so you can accurately buy within your budget. Once you know accurate measurements you can decide on the material you want and buy only what you need. Ventilation: You need to have proper ventilation if you want your roof to last. Installing good ventilation can save you from having to do expensive replacements. Ventilation regulates temperatures keeping the roof cool in the summer and preventing moisture in the winter. Look into ventilation options available so you can help your roof last longer. Materials: There are wood and sealant under rubber membranes and a top material that makes up your roof. Only replacing the top layers may not solve the problem. If the underlying materials are weakened, the new top materials will be a waste as damage can still happen from below. Reputation: You need to make sure you work with an experienced and professional roofer. 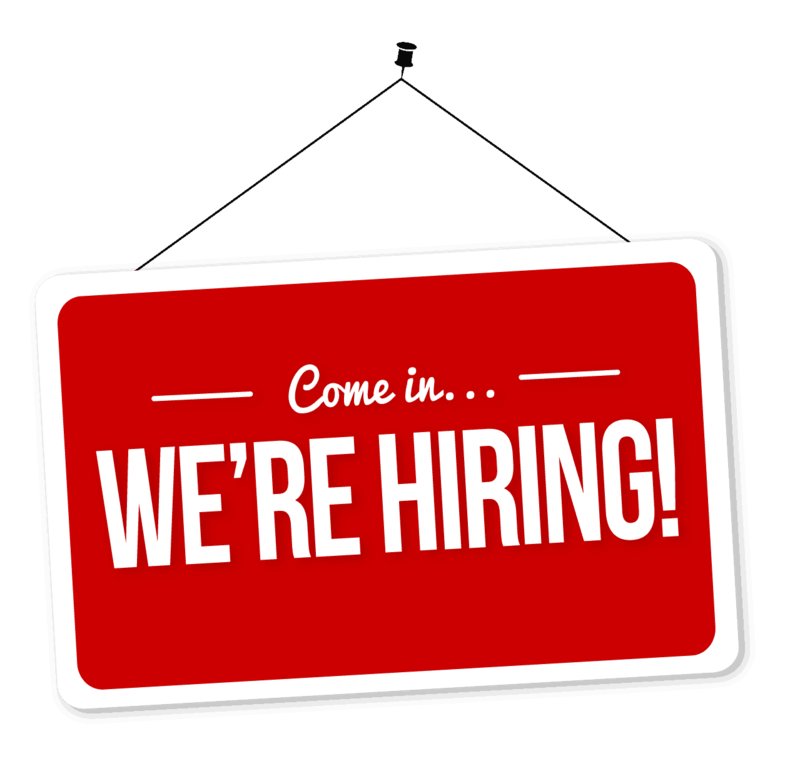 Do some research before hiring because there are many to choose from. A good roofer will inspect the property and provide an estimate first, so avoid anyone that charges for these right away. Checking reviews from previously satisfied customers is also a good way to find a good roofer. Do some thinking before investing in an expensive roof replacement. Contact a licensed roofer to inspect your property and they can advise if you need repairs or replacement. We provide free estimates and suggestions to fit every problem and every budget. Call us today to make an appointment. Don’t ever assume the age of your roof. It is important to know how long your roof will last and regular maintenance and inspections are the best way to ensure that you get the most years out of it. Most roofs last for decades providing they have been cared for. You need to make a point to start checking it regularly for damage whether the roof is old or new. 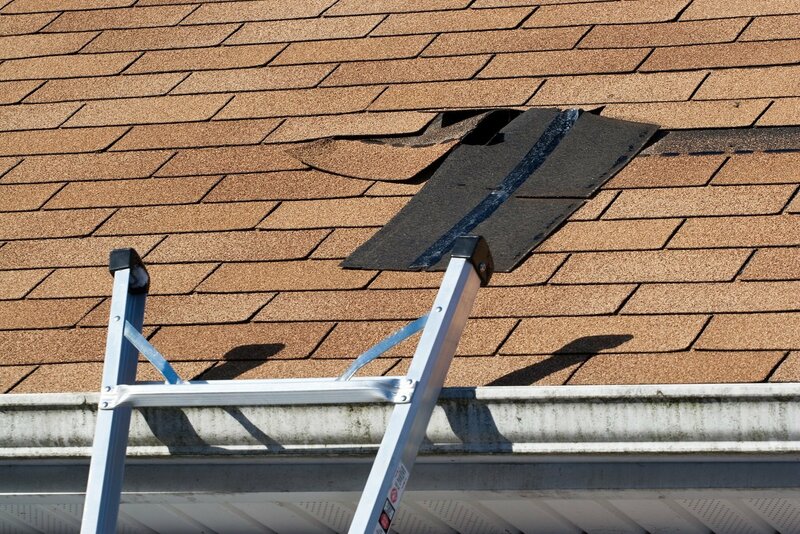 It is better to find any damage early on to prevent serious damage and entire roof replacement. Over time untreated damage can affect the structural integrity of the building. Learn about the different roofing materials so that you know the best way to care for your roof. Most building come with asphalt or composite shingles and these last around 20 years. The premium version can last close to 50 years. If you have fiber cement you can expect it to last close to 25 years and architectural asphalt and cedar shake will last close to 30 years. Some materials can last even longer like metal which will give you between 40 and 80 years. Slate and tile will give you even more years lasting between 80 and 100 years. All roof materials an potentially be damaged by severe weather. Harsh winds can push shingles out of place or pull them away entirely. Missing shingles or gaps can leave other areas of the roof vulnerable to exposure and damage. Depending on the airflow through your house, winds can create suction and pull materials away. 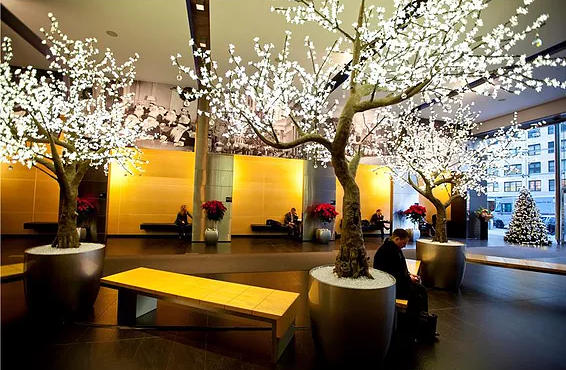 It also causes objects like trees to fall and dent or crack the roof surface. Hail is a serious weather problem which involves small or large ice balls being thrown forcefully at your house. You can end up with dents and cracks as well as shingles being worn away. Most materials can withstand smaller hailstones but it is a good idea to check your roof completely after any big storm. Most roof materials can tolerate snow and ice but heavy snowfall can cause cracks. Cracks pose a serious problem because they allow melted snow to seep in and the refreeze and expand. This loosens and moves tiles causing weakness in the roof. The sun also causes cracks and damage because of the strong UV rays. Over time constant exposure can break down materials leaving the roof vulnerable. Always check your roof for signs of damage and aging such as curled shingles or any cracks and missing pieces. Check your gutters for granules if you have an asphalt roof and look for punctures and weak spots with slate and tiles. Weakened slate and tiles will also show signs of wear through rough surfaces and flaking. Don’t forget about your chimney and skylights as these are notorious for rusting and denting which allows water to seep in. Any cracks can be home to mold and moss, so be sure to look thoroughly for that. Wood shake, in particular, is vulnerable to moss because it absorbs water over time which allows mold to grow easily. Always check your roof on the exterior and interior. Go to your attic to look for leaks, staining, and wet spots, using a flashlight when necessary. If you find damage do not jump to the conclusion that you need to replace your roof. Chances are if you catch the damage in time, there are options for repair that will not be as costly as the replacement. You want to get the damage inspected and evaluated right away. As professionals with vast experience and knowledge, we can assure you that we will provide an accurate assessment and fair estimate for repairs. When it comes to your roof, the most important thing to remember is that regular inspections will add to its overall longevity. CONTACT US FOR PROFESSIONAL ROOFING SERVICES!